Normally when someone upgrades a laptop, that means 'Throwing the old laptop into the garbage and getting a new laptop' but today I upgraded a dual core laptop to a quad core. The laptop is originally an Acer Aspire 5750 with an Intel i5 2410M Sandy Bridge CPU. This is a dual core CPU at 2.3ghz, with a turbo speed of 2.7ghz. It was a great laptop, it served me well while editing standard definition footage in my first year of college, however it's high definition time. I didn't want to buy a new laptop, I just got this thing in July 2011 and I liked the thing other than it's CPU. I previously upgraded it from 4GB of RAM to 8GB but RAM upgrades on a laptop are a trivial task. The CPU though? Hmm. Doing research I discovered that there were i3 models of the 5750 but also an i7 model. Some models of my laptop ran an i7 2630QM and that was promising. Some laptops infact are unhappy with CPU upgrades and the BIOS's have artifical restrictions and will refuse to boot with different CPUs. Also, many laptops just have the CPU soldered into the mobo, rendering upgrading impossible, because some OEMs are jerks. So I Googled up the Aspire 5750/5750G service manual and found not only complete disassembly instructions but even a list of CPUs compatible with the system. 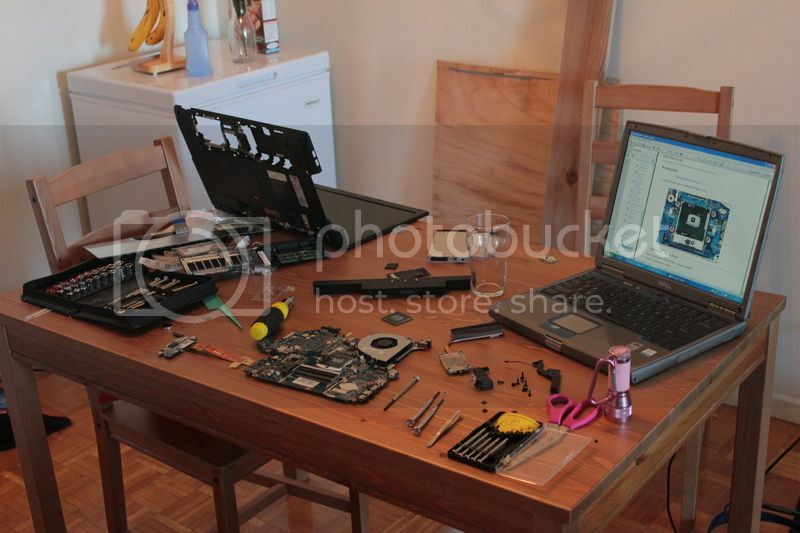 Even the i7 2820QM was supported, but that thing is $400 on eBay and I only paid $550 for the laptop originally. What I picked out was an i7 2630QM since some models of my laptop shipped with that anyway. $180 for one on eBay and it sounded fair. I did have some concerns, the manual listed two types of mobos, one for dual and one for quad cores, but issued no warnings about compatibility. There were also two thermal coolers, a dual and a quad. The difference? The quad one had two heat pipes and the dual had one. That makes sense. Hopefully a single heat pipe between the CPU and the fan will be enough. What next? What else. I ripped it apart. So, now came the important part: Will it POST? I put it back together just enough so I could power it on and it refused to POST. Then I remembered to install the RAM, and it POSTed! I finished reassembing it entirely and got'er going. What are the results? That varies really. Most of my gaming related benchmarks are the same or even slightly lower. Why? Because the thing still only has an Intel HD 3000 integrated graphics solution, so the CPU isn't in high demand and when it was, a dual core at 2.3 offered more kick than a quad at 2.0. This is because games arn't the most efficently multithreaded things in the world. On the other hand, this machine isn't a toy for me anyway, it's for editing video and my Adobe Software, especially Adobe After Effects, runs much more nicely than it did on the dual core. I can even set this machine up to do network rendering with my 4.6ghz desktop and they'll work fairly nicely together. Mission accomplished. There is also a minor heat issue, this thermal spreader was not the one designed for a dual core so it can get kiiiinda hot... Like 83'C hot. (More like low 70's on average when running gaming bench marks That is fairly hot but not a real danger to the system, it would shut itself down if it reached an even dangerous level. So there you have it, SOME laptops can have their CPUs upgraded out right. Though for higher end laptops, where the number of CPUs worth upgrading to are more limited, it could not even be worth it. There is even a Nvidia graphics enabled version of my laptop, the 5750G. I could technically 'upgrade' to that Nvidia graphics if I chose, but it wouldn't quite be practical. The GPU is soldered onto the mobo, so it would require ordering a used, recycled 5750G mobo and swapping the whole thing out, it'd be a major expense just to add discrete graphics. This isn't a gaming laptop either, it's not what I bought it for, so this upgrade is enough. Re: Let's upgrade a laptop! Hella big image changed to link. Not too surprised that heat is an issue, as the i7 you got can dissipate 10W more heat than your old i5. If you can find a vendor, it still may be worth trying to get that better cooler. Kariudo wrote: Hella big image changed to link. It's not actually a big image, it was uploaded directly to photobucket and scaled down later. The only large version is in your cache. It's 800x533 now. So would you mind reverting it back to an image with tags? Kariudo wrote: Not too surprised that heat is an issue, as the i7 you got can dissipate 10W more heat than your old i5. If you can find a vendor, it still may be worth trying to get that better cooler. It's likely an artifical cap and not necessarily enforced. A LOT of laptops with two slots say they can only do 4GB sticks when the hardware should support 8GB. This includes a lot of Mac desktop and laptop products, however it's been found that many of them will take 8GB sticks even if it's contraindicated. I suspect it's because not all 8GB sticks could work, so it's better to be safe than sorry or something. So while it's LIKELY that 2x8GB would be supported, it'd still be a $75 gamble. Still showing up as 2048 x 1365 for me after a few force refreshes. The change finally went through. I guess you gotta ask yourself one question, "Do I feel lucky?" Kariudo wrote: I guess you gotta ask yourself one question, "Do I feel lucky?" I'll test my luck in August. I nabbed that CPU because $180 on eBay was great when others wanted $220-$250. But RAM is easy to get off the shelf and new, and if anything it'll be cheaper by August. Mister Hatt wrote: Best thread I have seen on this forum ever. My macbook air hits around 90C for up to 8 hours when I do number crunches on it so 83C in a laptop with a fan that doesn't fail is probably quite fine. It shouldn't go over 85'C anyway. I found a modded, unlocked BIOS for it so I could see all options. It's apparently set by default to throttle the CPU at 85'C and engage auto-shutdown at 100'C. So I doubt I'll see it cross 85'C, that makes me feel comfortable. Also interesting, there are HDD caddies for the ODD bay. They're aftermarket, but they'll let you remove the optical drive in place of a dummy that'll mount a second HDD inside it. It's nice to know that I could give this thing more storage without having to just replace one drive.